How important is filtration to rainwater collection? That all depends on the catchment surface and air quality. If you are catching rain straight from the sky onto a clean food safe surface (like we do) you really don't need it unless you intend to drink the water and even then a simple cloth filter (for dust) will suffice. But if you are catching rain from a roof you certainly need it to remove the zinc, hydrocarbons, accumulated pollution and droppings especially if you want to use the water for household or agriculture use. 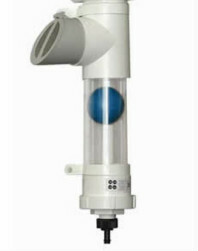 A first flush diverter (see picture) is often used as a front line defense. This filters water by diverting the initial roof runoff into separate pipe based on the assumption the first few liters contains alot of the bad stuff. But first flush is not enough as it only removes about 40% of both dissolved and suspended solids. After that you still need varying degrees of filtration and that adds up. From that perspective, standalone rainwater harvesting is not just simpler and cleaner but cheaper!